At the end of the 1968 racing season, the Automobile Club de l’Ouest (ACO) released several new important regulations aimed at reducing average speeds. The only cars that would be eligible to compete for the World Manufacturers’ Championship were three-liter prototypes, exotic racing cars built in small numbers, and five-liter sports cars that had to be constructed in a series of 25 identical examples. Porsche recognized this new dictate as an opportunity to create a world-beating five-liter sports racer that would be campaigned alongside the three-liter 908. If the new car was at all successful, Porsche would finally have a serious chance of overall victory at the 24 Hours of Le Mans. The new Porsche was the direct result of years of intense research. Though it employed the most modern concepts in automotive design, the new car was absolutely in keeping with Porsche tradition. The foundation of the new model was an incredibly lightweight aluminum space-frame chassis. Similarly, the suspension systems made extensive use of lightweight materials, such as titanium and magnesium. Glued to this frame was a striking, streamlined body made from thin fiberglass. Covered in NACA ducts and suspension-controlled aerodynamic flaps, the shape of the new Porsche was honed in the wind tunnels at Stuttgart Technical Institute. Each car was designed to wear both short and long tails, the latter specially designed with Le Mans’ Mulsanne Straight in mind. The magnificent car’s air-cooled flat 12-cylinder engine is an undisputed masterpiece of automotive engineering designed by the legendary Hans Mezger. With dual overhead camshafts, twin-plug ignition, Bosch mechanical fuel injection, dry sump lubrication, and the distinctive, mechanically driven six-blade fan, it delivered 580 bhp at 8,400 rpm in original 4.5-liter form. In light of these issues, Porsche continued to perfect the 917 throughout the 1969 season, developing the car race after race, test session after grueling test session. By 1970, the new-and-improved 917K (K was for Kurz, or “short”) was ready to take on the world. 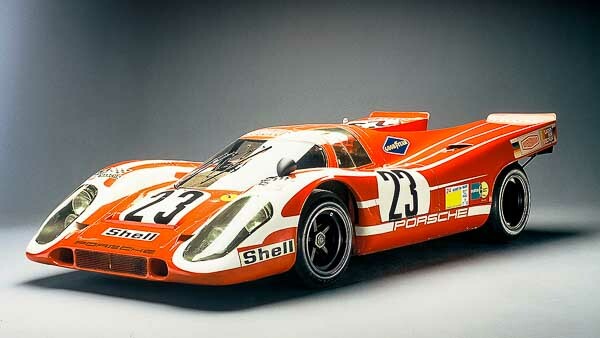 Throughout the entirety of the 1970 and 1971 seasons, the Porsche 917K was the car to beat. During this period, the 917K achieved back-to-back wins at the 24 Hours of Le Mans, and Porsche won its second and third Manufacturers’ Championships. Except for a victory at Sebring by Scuderia Ferrari and three wins by the Alfa Romeo Autodelta team, Porsche won every championship race on the calendar for two years. In just four years of production, including two years in turbocharged Can-Am specification, the Porsche 917K was established as the ultimate sports racing car of the era. Its success meant that Porsche, previously respected as a class winner, had now attained the sport’s highest level of acclaim.